On the morning of April 11, 2019 local time, Premier Li Keqiang, accompanied by Prime Minister Andrej Plenković of Croatia, went to the Peljesac Peninsula in southern Croatia to inspect the Peljesac Bridge project which was built by Chinese enterprises through bidding. Li Keqiang and Andrej Plenković went to the construction site of the bridge project by ship and car amid wind and rain. On the way, the leaders of the two countries were listening to the situation of the project introduced by the heads of both sides' enterprises. The Peljesac Bridge is the biggest transportation infrastructural project between China and Croatia since the establishment of their diplomatic relations. The bridge, 2.4-km long, is designed to cross the Mali Ston Bay over the Adriatic Sea and link the territory of Croatia. 85 percent of the engineering cost of the project is covered by the funds of the European Union (EU). A Chinese consortium headed by China Road And Bridge Corporation won the bidding through fair competition and started construction in 2018. The project is progressing smoothly. Li Keqiang learned in detail about the project progress, construction cost, building materials, environmental protection standards, construction period and other situation, and interacted with the heads of enterprises of China and Croatia. 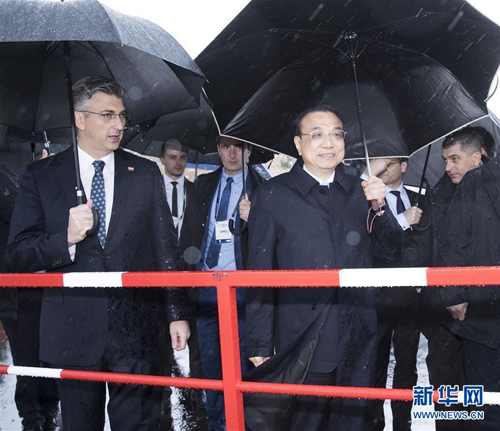 Li Keqiang congratulated the Croatian side on choosing competitive Chinese enterprises. For more than 40 years of reform and opening up, Chinese enterprises have accumulated rich experience in the field of infrastructure construction, and will adhere to high levels, high quality and high standards in building the bridge. Premier Li Keqiang and Prime Minister Andrej Plenković also discussed the prospects for China and Croatia to conduct new infrastructure construction cooperation. Premier Li Keqiang and Prime Minister Andrej Plenković arrived at the construction site of the project and delivered speeches. Li Keqiang said that the Peljesac Bridge, acquired by Chinese enterprises through fair competition and open bidding, follows market principles and abides by rules of the EU. The bridge is a bridge of friendship as it links the two sides of the Mali Ston Bay, embodies the friendship of Chinese and Croatian peoples and is conducive to regional peace, stability and prosperity. The bridge is a bridge of welfare as it will be conducive to logistics, personnel exchanges and life of local residents, and it vigorously improves the social and economic development and people's well-being of Croatia. The bridge is also a model of trilateral market cooperation among China, Croatia and the EU. Chinese enterprises will build a high-quality bridge with the best equipment and technology. Li Keqiang emphasized that Chinese enterprises should fulfill all the requirements of the contract, build the bridge into an excellent high-quality project that can withstand all rains and winds, and ensure the completion of the project as scheduled, so that the Croatian people can enjoy the convenience and benefits of the bridge at an early date. Prime Minister Andrej Plenković expressed that as a major infrastructure project carried out by Croatia and China, the Peljesac Bridge is a symbol of the friendship and cooperation between the two countries. Local Croatian people have expected this bridge for many years, and their dream finally came true with the help of Chinese friends. The bidding process of the bridge was open, fair and transparent and the Chinese consortium won the bid with the most reliable capability. It is believed that the bridge will surely be completed on schedule. After completion, the bridge will help facilitate the Croatian people's travel, vigorously promote local development, and also provide opportunities for Chinese enterprises to open up new markets as well as play a demonstration role for EU-China practical cooperation. Afterwards, Premier Li Keqiang and Prime Minister Andrej Plenković jointly pressed a button to start the piling of the main pier, and unveiled the nameplate marking the completion of the first phase of the bridge. They also warmly interacted with on-site construction technicians. Li Keqiang urged them to guarantee the construction quality and safety. State Councilor and Foreign Minister Wang Yi, and Vice Chairman of the National Committee of the Chinese People's Political Consultative Conference and Director of the National Development and Reform Commission He Lifeng attended the above activities. Li Keqiang arrived in Dubrovnik by special plane on the afternoon of April 10, local time. Premier Li Keqiang's wife Cheng Hong, Wang Yi, He Lifeng and other delegation members arrived by the same plane. During his stay in Dubrovnik, Li Keqiang will also attend the 8th Summit between China and Central and Eastern European Countries and other activities.